In his 2010 book Transport for Suburbia, Paul Mees notices a fallacy that seems to be shared by sustainable transport advocates and car advocates. Both sides of this great debate agree that effective transit requires high density. Sustainability advocates want higher urban densities for a range of reasons, but viability of public transit is certainly one of them. Meanwhile, advocates of car-dominance want to argue that existing low densities are a fact of life; since transit needs high density, they say, there’s just no point in investing in transit for those areas, so it’s best to go on planning for the dominance of cars. The central argument of this book is that density is not destiny. Transport policy itself has a bigger impact on transport patterns than urban planners have realized, and suburbs don’t have to be totally reliant on the car. Planners who insist that car dominance can only be addressed by impossibly large increases in density may actually be entrenching the problem they are trying to solve. First, it offers no hope to places that are already built at low densities and unlikely to change. Second, it gives public transit in low-density areas an excuse for descending into a cycle of underinvestment, official neglect, and lazy operations, because after all, nobody expects public transit in low density areas to be any good anyway. Third, it invites sweeping claims about transit’s viability based on the overall average density of a city, claims that, as we’ll see, make no sense at all. Mees is right that “density is not destiny.” Cities of any density can make better or worse transit choices and achieve significantly different outcomes as a result. But density is still an overwhelming force in determining the possibilities and outcomes of transit, and we can’t begin to make good transit decisions until we understand it. Density is hard to talk about for two reasons: It’s very emotional and it’s hard to define and measure. The emotions are inevitable: Whenever we talk about urban form, people hear us making judgments about their homes. I can stand in front of a group of citizens and talk about how a certain kind of development pattern implies certain consequences for transit, and thus for sustainability, and thus for civilization. As we talk, it may appear that we’re having a thoughtful and educational discussion about good and bad design. But some people in the audience have chosen to make their homes in the very development pattern that I’m describing. To those people, I’m saying that their home is good or bad. Once you hear that, you’re likely to have a strong emotional reaction that makes you deaf to rational argument. On some level, consciously or unconsciously, you’re going to feel as though I’d walked into your own livingroom and told you that your decor is not just ugly but a threat to civilization. We all feel defensive about home. “Density” in an urban planning context is always some kind of quantified human presence divided by some kind of land area, but it can be residential density (residents or homes per acre) or it can be total development density — including homes, businesses, schools etc – or it can be an economic density such as the number of jobs in an area. “Toronto,” of course, can be the City of Toronto, or the Toronto Transit Commission area, or the whole urban mass of greater Toronto. These obviously have utterly different average densities. So the statement “the net density of Toronto is ###/hectare” is really as subjective as the statement “I think that cities should have more open space, narrower streets, and should have single governments covering the entire urban area.” Because each of those opinions can affect how you choose to define “net,” “density,” and “Toronto,” which in turn determines the number that you declare, with cold factual authority, to be the net density of Toronto. “Metro Area” (my term for what Mees’s table calls “City”) is the entire urbanized area around a city, regardless of government boundaries. Think of it as the continuous patch of lights that you can see from an airplane at night. “Density (pop/ha)” is residential density – the entire population divided by the entire area. “Transit work mode share” is the percentage of trips to work that go by transit, as opposed to car, walk, bike, etc. Trips to work are not the only ones that matter, but they are the only ones that are measured in a consistent way. mode share for work trips. The density figures are calculated to shock. Los Angeles is denser than New York? Yes, that’s what happens when you average over a huge contiguous metro area. Your own impression of “New York” is probably formed by the massed and soaring towers of Manhattan, but New York is a dense city surrounded by a lot of very low-density suburbs that are all included in this concept of “metro New York.” Likewise, your stereotype of Los Angeles may be a ranch-style house with a big pool on a cul-de-sac, which implies a very low density, but in fact much of greater Los Angeles is four-story apartment buildings lined up for mile after mile. Obviously, our impression of the density of a city is based on the part of it we choose to remember, or that we tend to see on television. The average density of the whole urban area may be entirely different. To me, Mees’s table proves that average density over a whole urban area is the wrong kind of density for understanding transit. The impression you probably have of the densities of these cities is actually closer to the kind of density that matters. Transit reacts mainly with the density right around its stations. It is in the nature of transit to serve an area very unevenly, providing a concentrated value around its stops and stations and less value elsewhere. So what matters for transit is the density right where the transit is, not the aggregate density of the whole urban area. Of course, what matters even more precisely is how much stuff is within walking distance of a station, so it’s not just density (the amount of stuff in a fixed radius) but the completeness of the pedestrian network. A poorly connected pedestrian network can ensure that much of the stuff that’s within a 400m radius is not in a 400m walk. So yes, Las Vegas has massive quantities of apartment buildings, which yield a high average density. But at two levels of scale, these are deployed in patterns that make effective transit difficult. On a macro level, Las Vegas is mostly midrise apartments spread over a large area, requiring transit to cover more distance to serve them; this is the most obvious explanation for Las Vegas’s low transit performance compared to highrise Vancouver. But the micro explanation is important too. In the details of street pattern and pedestrian circulation, typical Las Vegas urban fabric is designed for motorists and hostile to pedestrians. Average urban density says nothing about either of these factors, even though they are what really determine the transit experience in each city. It’s inevitable that in comparisons between cities, we’re going to hear average density figures. These figures are better than nothing when it comes to making global comparisons. The famous databases created by Jeffrey Kenworthy and Peter Newman, for example, are useful in showing how a range of sustainability outcomes vary with density. But averages are dangerous, especially in transit. Averaging sounds like a credible way to draw a simple fact out of a huge and diverse reality, but often, averages are just not the fact that matters. In a recent post on the perils of average success, I pointed out that no transit customer really cares about average frequency, or average lateness, or average crowding. By the same token, transit advocates need to be suspicious of average density. What matters is the density around the transit system. How can we best measure that? In the US, “an ‘urbanized area’ is defined for each metropolitan region, made up by combining adjacent ‘census blocks’ (the smallest units for which data are collected) with more than 1000 residents per square mile, or 386 per square kilometre. … Canada defines “urban area” on an almost identical basis to the US, using a density threshold of 400 [residents] per square kilometre.” The data is from 2006 census in Canada, 2000 in the US. Density is one of those hot-button issues that people obsess over, and most of all, misunderstand when they hear or use the word. Good urban design will generally always be conducive to decent transit service for the reasons you outline. We need to be good urban designers — not micro-managing bureaucrats who create an “ingredient list” that developers must follow, only to be disappointed with the outcome when they do follow them exactly (as noted by the lovely cluster housing nightmare in your Vegas image). The best term I have heard describing Los Angeles that I like to use is “dense sprawl”. This solves the debate (of late) regarding LA and if it is actually sprawl or a dense metropolis. Also, density can become much more enlightening to people when they realize that building height often has little to do with density. Yes! I talked about this a year and a half ago, and it’s glad to see others pointing it out as well. I’ll need to read Mees’ book before commenting on the density argument. But for now I’d like to point out that a good cyclist network can increase the catchment of a transit node substantially – from 400km walk to a very comfortable 2.5km bike ride which can be done in about 10 minutes. What do you think of the potential for bike-and-ride and bus transit? Many of Perth’s rail stations are in the middle of the freeway, which severly limits walk up patronage. As I understand it, most people get brought in by feeder buses and cars. So you can go from 40/ha down to 8.4/ha, which means the notion of density is useless unless you define your area. One could define the total metropolitan area for transit purposes as everything that is within 50m of the road network. All population lives close to roads, and that is also where most of the transit goes along. If transit has to traverse long distances to get to people, than this measure should capture that. Inversely, if the road network is compact (so that the there are many roads within 50m), which is good for transit, then also the area would be small. While I agree with your overall points, I think it is important not to let misstatements of density go unchallenged. According to Wikipedia, the city of Los Angeles has a density of 8,205/sq mile while the city of New York has a density of 27,532/sq mile. In other words, New York residential density is over three times as dense as Los Angeles. That is just what most people would expect. The second thing is that I think employment density is at least as important as residential density for successful transit. The difficulties associated with getting people working in low density suburban office parks to use transit are far greater than getting people who live in sprawling development to use transit. Ross. As I noted, Mees is using metro area density, not "city of". He follows Kenworthy/Newman in defining metro area density as the contiguous mass of urban development regardless of extent. Again, it’s the patch of lights visible from the plane at night. The problem with metro area density is that it’s vulnerable to changing the definition of a metro area. Slightly relaxing the definition would add vast swaths of lightly populated territory to the area, making density look lower. Try to compute the density of Greater LA with all of San Bernardino and Riverside Counties thrown in. The solution is weighted density, which unsurprisingly correlates with transit use much better than standard density. Note that the metro area densities Mees uses are not just aggregates of whole counties. It's a contiguous mass of urbanized census blocks, extending how ever far the urban mass extends. Weighted by population. Standard density can be thought of as averaging all census tracts weighted by area; weighted density (or perceived density) weights them by population. It answers the question “What density does the average person experience?” rather than “What density does the average piece of land experience?”. How come the influence of available supply of transit service is never factored? What if transit service is underused because it’s not at a span, frequency or cost that is attractive to riders? This might be more realistic than saying that a line needs, say, 6,500 persons/mile in order to support 15-minute midday service. I don’t even know if such a correlation matrix exists. I also see a pitfall where non-riding advocates overemphasize land use and hope density pops ridership without a corresponding investment in increased transit service. Back in 2008, Chris Bradford over at Austin Contrarian, addressed the entire idea of weighted density pretty clearly and succinctly below. Once you make the distinction between weighted and average density, then once again density really does matter in driving transit usage. The problem is that a lot of land use policy is about merely increasing average density and not enough about increasing weighted density. When you’re using density to predict the success of a transit service, sometimes no weighting can help you, not even when you throw in both residential and employment density, because there’s always the possibility of something more complicated going on. The extreme hypothetical example would be if you’re analysing a transit corridor A with lots of people and lots of jobs, but none of them would ride a line in that corridor, because all the people who live in corridor A work in corridor B, and all the people who work in corridor A live in corridor C, neither of which have good links to A. And, now that I think about it, this isn’t too far from the situation on the VTA’s Tasman West light rail line in Santa Clara County, which runs through both high-tech office parks and huge and fairly dense trailer parks and isn’t exactly known for its high ridership. which gets interesting the moment that a certain image of, say, L.A. comes to be seen as normal, along with the representation of cars as the only realistic means of transportation. so the problem is not just how to rationally measure what really exists–and this is a serious issue as this discussion shows–but also what people believe it to be like, nevemind the facts. So I’d add another question to your conundrum: how do you change the wrong/insufficiently differentiated perceptions that the voting public has? While density does have a roll. If transit doesn’t take people where they want to go. It doesn’t matter how dense your city is. Transit mode share will be poor. Also if people perceive transit to be inaccessible. Whether because of infrequent service or it is hard to get to the bus stops. They won’t take it. Alon – thanks for the link: your reference is exactly what I have been looking for. I actually encountered this issue on a recent project where I was running “mode choice” regressions using normal density metrics, which were not statistically significant, in contrast to the weighted density which was strongly significant. This post reminds me of a general rule of thumb that “averages can hide more than they reveal.” Statisticians have developed a whole range of parameters and techniques to deal with variation that transport planners need to be familiar with. Mees should know better than to draw major conclusions from a small selection of “average” statistics. The density of the New York metro area (Combined Metropolitan Statistical Area) is 2,029 persons per square mile. The Los Angeles CMSA is 482 persons per square mile. The density of the New York Primary Metropolitan Statistical Area (PMSA) is 8,159 persons per square mile. The Los Angeles PMSA is 2,344 persons per square mile. That goes to show that density statistics can vary widely, simply by drawing different boundaries. There’s more discussion of this at Fun With Density and Transit Statistics. But anyway Jarrett, all of your points are excellent and right on target. Especially the importance of micro level design and walkability, which often is overlooked. And take a look at the weighted density method that Alon mentioned. When you say “what matters for transit is the density right where the transit is, not the aggregate density of the whole urban area,” that is similar to the view that weighted density puts forward. The Austin Contrarian did a series on that topic; see for example this post. 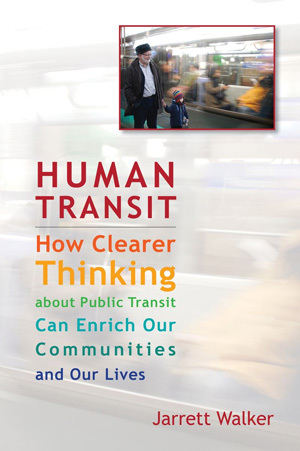 It is certainly true that higher density tends to lead to greater transit use, but then so does higher pedsetrain connectivity, and so does having cleaner buses. The challenge for the transportaion planning profession is too figure out how to get higher levels of transit use where increasing density or improving pedestrian connectivity isn’t possible (within the required timeframe). Sorry for double posting… I recommend visitors read http://www.joelonsoftware.com/articles/fog0000000052.html , which talks about what stops people switching from one piece of software to another, which I think is very applicable to those of us trying to get peopel to switch from one transport mode to another. The article talks about barriers to entry, and how every barrier eliminates a certain proportion of your potential usergroup. By the time you get to 8 or 10 barriers, you’ve excluded so many people that your share will be tiny. When you remove that last barrier, your share will suddenly go through the roof. I’m surprised nobody has talked about transit costs. Density matters, but so do costs, and it is troubling that so many people ignore them as a factor. Lets say that a transit agency has a fare of $2. A bus with operating costs of $100/hr and 50 riders/hr is just as viable as a bus that has operating costs of $200/hr and 100 riders/hr, which is just as viable as a bus that has operating costs of $20/hr and has 10 riders/hr. When we let operating costs run rampant, we depend more on subsidies for a given level of service, and we make lower density transit less viable. And it doesn’t need to be that way. In terms of the US Census, the definition that Jarrett’s talking about is “urbanized area.” The urbanized area draws a line around where people actually live, the metropolitan area uses counties as its units, which often draws in rural and undeveloped areas into the calculation. Metropolitan area is more of a political definition, urbanized area a demographic one. Part of the problem with writing about Los Angeles is that many people have misperceptions of it. The city of Los Angeles is, in fact, pretty dense by American standards, especially in the central neighborhoods (check out Koreatown sometime). Los Angeles and Miami are, I believe, the only two U.S. cities that have gotten consistently denser from 1950 to 2000, as there have been ongoing flows of immigrants to keep central neighborhoods populated. And as Jarrett has said a few times, a lot of people in fact use transit in Los Angeles, and there could be more. I find that it’s not transit agency people that want to use simpleminded formulae for evaluating transit service. The transit people know how many complicating factors there are. It’s developers and non-transit planners who, understandably,want some quick shorthands for what transit should be there. They don’t like “it depends” as an answer. If we’re going to talk about average densities of urban areas in the U.S. neither the MSA, the PMSA, nor the municipal densities are remotely useful because they are not consistently defined between urban areas (Census data for California is particularly troublesome because it is based on counties and California has counties that are larger than many states). The Census defined urbanized area is at least potentially useful because it is defined consistently from city to city. This being said, density at this kind of macro level doesn’t strongly influence transit use. The weighted density does and is a better metric. Unfortunately, it is less intuitive and may be more difficult for planners to use. Winston is correct that the Census urbanized area definition is the same for all US cities, unlike political boundaries such as Census-defined metropolitan area. But I’d argue that urbanized area itself is somewhat arbitrary. For instance, New York City is 19.5% park area, while the City of Los Angeles is 7.9% park area. In both cities, nearly all of the park area is classified as urbanized. That affects the density statistics. Census-defined urbanized areas can include densities as low as 500 people per square mile (1.28 acres per person, or 3.2 acres per household). Those are exurban densities — not what I would consider urban, but not rural either. Changing the density thresholds would change the urbanized area boundaries, which would change the average density within the urbanized areas. That in turn would change the relative ranking of Los Angeles. Using their measurement L.A. has a perceived density of 12,436 per square mile, while New York is 34,263. A measurement that makes sense! The idea is you take each area (the smaller the areas the more accurate the measurement, I suppose, but any subdivision of the total area will be helpful), and weigh the density of those areas by the number of people in the area. Imagine a simple case, a city with two sections, each 1 square mile. The total population is 10,000, so the density is 5,000 people per square mile. Good points all around. I’ve been doing some applied research with my colleagues, particularly on what the factors that most influence transit use. The 3Ds (or perhaps 5, if you include destination accessibility and distance to transit), density, diversity, design, have always been considered critical to any successful transit supportive neighborhood. Previous studies have indicated the importance of density in driving transit use, but there has been limited conclusive research showing which of the 3Ds might be most important. Fortunately, Ewing and Cervero have performed a recently released meta-analysis, which shows that behind distance to transit, urban design (primarily street connectivity) is the most important factor positively influencing transit use when controlling for other variables. Not only that but they found that it’s considerably more important than density. The study’s sample size was a bit limited, and thus is not conclusive. Nevertheless, the results and implications are intriguing. Maybe Las Vegas is the perfect example. There are probably a number of neighborhoods that are dense enough (say 15+ dwelling units/acre) to support frequent transit service, if using that criteria alone. However, Jarrett has pointed out the problems with some of those places experience with regard to lack of transit support. Density is clearly very important in supporting quality transit service, and one would expect that many places that have high density also have good urban design features. But, if urban design is among the most important factors in supporting transit use, what does this mean about how we design our neighborhoods? Maybe it means that if we want to maximize ridership and cost effective public & private investment, more focus should be placed on infill development in existing urban areas that already benefit from a walkable urban environment, and supporting this development by providing increased transit service to these areas. But in green- or greyfield TOD areas, perhaps this also means that just as much as focusing on development densities, we need to ensure that the streets (bones of the neighborhood) are well-connected and walkable. Ultimately I think that density does matter on both ends of the trip rather than just thinking about general density. I think that’s what you’re trying to say right? And the notes about the Austin Contrarian’s weighted density are spot on and have been corroborated by research done at the University of Minnesota by Gary Barnes. Ultimately Barnes found that increasing density mattered little in terms of transit ridership for a work trip unless it was tied to the end of the trip. In other words, the employment density of a place (ie downtown or suburb) determined the transit trip from another place. So if you had a place like downtown that was the destination, increasing your residential density from the origin had an effect as long as the density at the destination (job center, downtown) was sufficiently high. Raising the density in a suburb does much less if the trips are to more suburban job centers. Totally agree–for effective urban density, you also need walkability. When I was working at Calthorpe Associates over the summer, we devised a system of measuring walkability by looking at intersections per square mile. The results were pretty interesting for California–you basically find that most good walkable areas in SF, the inner East Bay, and random downtowns and neighborhoods here and there are in the range of 150-300 intersections/sq. mile, while most other large-block sprawl and pretty much all of SoCal is in the 75-150/sq. mile range. Really goes to show you how few truly walkable neighborhoods California has. Jarrett, what do you think?